Hi, not my first explore, but time my 3 year lurking spree ended with a report. 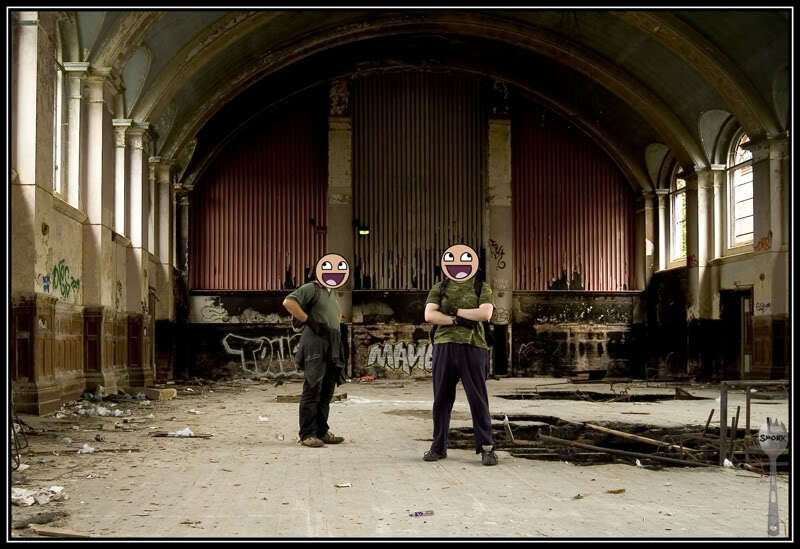 Whilst browsing the forums, I read that Hellingly was due for flattening in September and that security had been stepped up significantly. Time was running out for one of the places I've used as as reference for several bits of Level Design, and so along with a friend "Cagey", I decided to head up there and see what I could see. After a 6am start and a raging cold, I started the 3hr journey by train to this awesome place, arriving at just before 10am in Horsebridge. 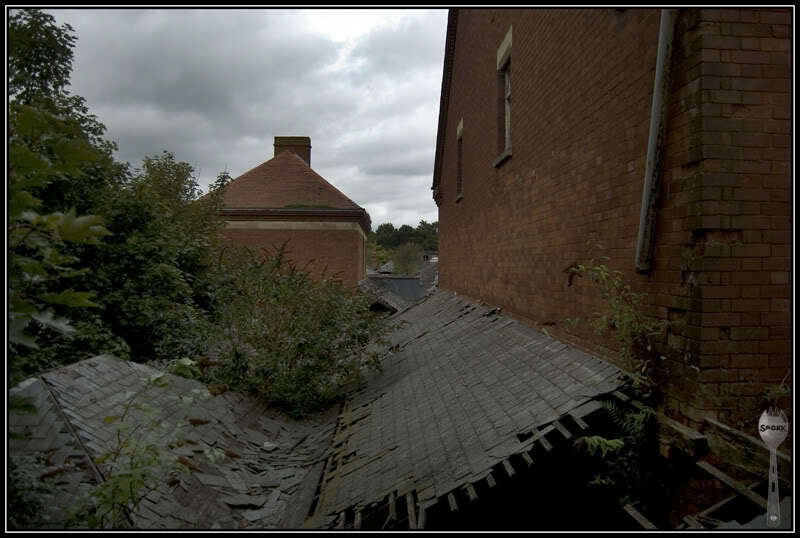 After meeting up with Cagey, we walked via the church in Hellingly to the crossroads. After a brief check with the binoculars to see what the security activity was like, we decided it was far too busy to just walk up the drive, as contractors were digging up the main road in, and there appeared to be plenty of security people hanging around. After a brief walk, I noticed a silver land rover with tinted windows, pull up along the path behind us. Followed already, and its not even lunch time! So we decided to try another of the routes in, continuing for a while when a silver mondeo pulled up on the left ahead of us for a minute or so, then pulled away. It was obviously not going to be straight forward this morning. 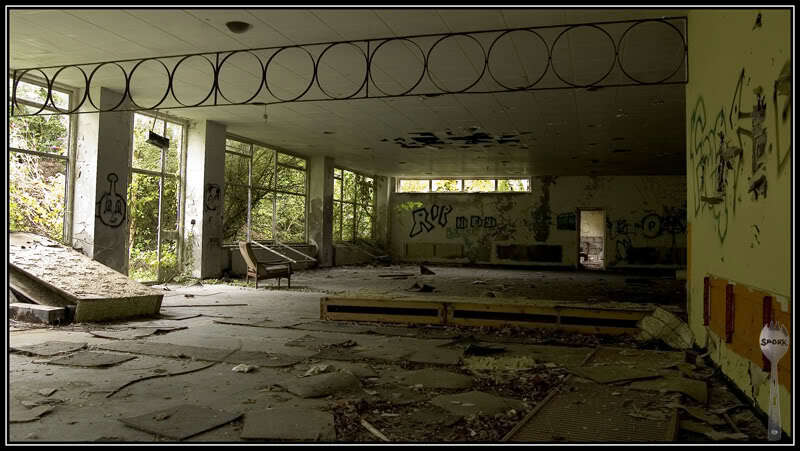 After about 2 hrs of walking, diving through barbed wire fences, crawling and dodging tractors to the sound of "get your fat arse in here" as I fiddled with the stuck belt buckle, we eventually made it into the hospital grounds unnoticed. Quickly traversing the well worn patrol route we eventually found a way in, and started to get ready for what looked like an epic explore. The ever presence of security dog patrols just heightened the excitement, having not dealt with such patrols on any of my other explores, it was a somewhat cautious walk out of the entrance rooms. 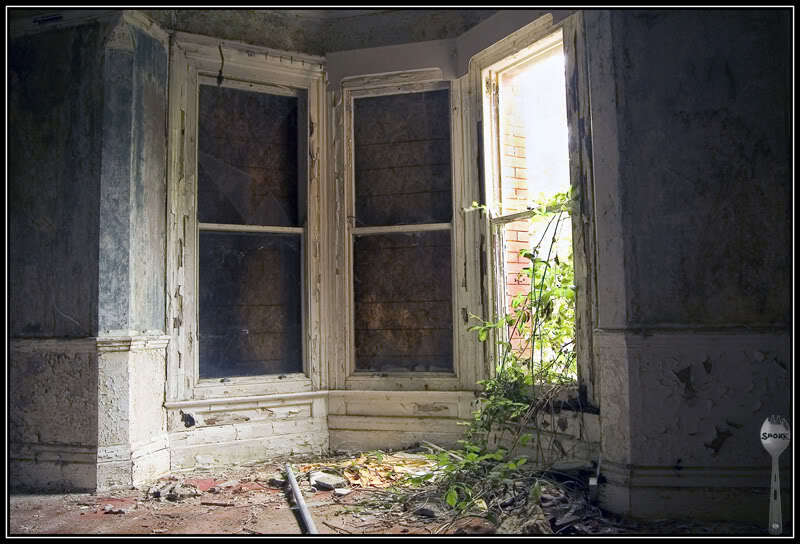 The rooms smelt musty, and were covered in root systems, it felt alot more derelict than it should after 15yrs. 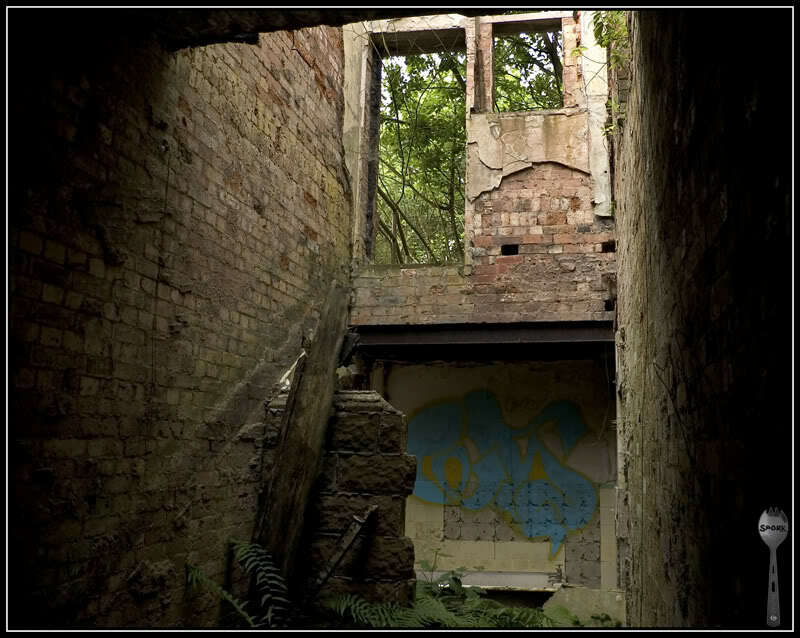 In fact in some areas, it looked more like 50yrs of abandonment rather than 15. 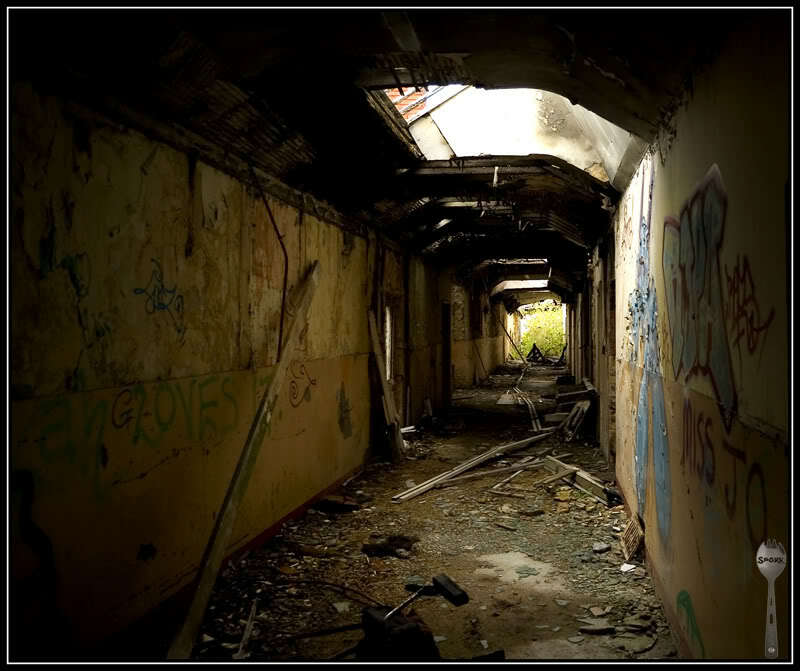 We carried on down the dusty broken corridor towards our first objective, the Ball Room, taking in the grunge and rust. 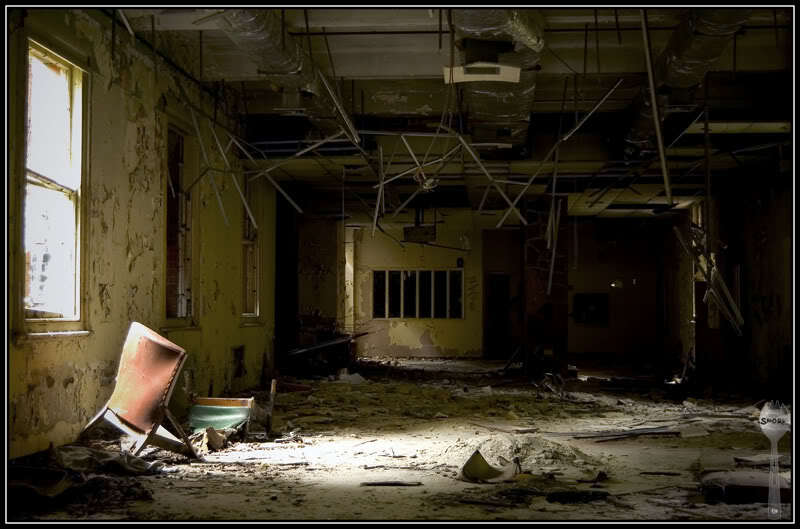 Some of the rooms really stood out, with pools of light dappling the rubble piles, and occasionally recognisable objects such as chairs could be seen strewn across the floor. Normally I hate taggers and graffiti, but in some ways, the graffiti here had some artistic merit, the red skull was interesting, highlighted with the square skylight in the background. 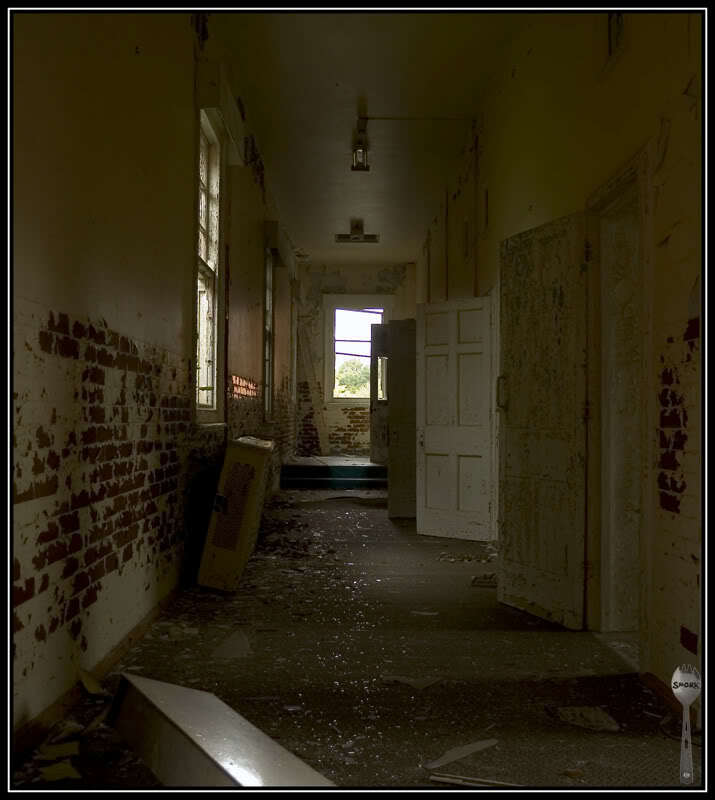 Unwilling to linger too long in one place, we moved on, crunching carefully down the battered corridor. The constant bangs, squeaks and rustles kept us ever mindful that security was on lockdown today, and so far they had shown themselves to be very much alert and capable, not wanting to underestimate them, we paused and flinched at any sound that appeared to have pattern to it. Eventually we reached our target, the Ball Room. It was magnificent, albeit a bit smaller than I thought it would be, but size is relative. The amount of fire damage in this room was saddening, no wonder security had been stepped up. 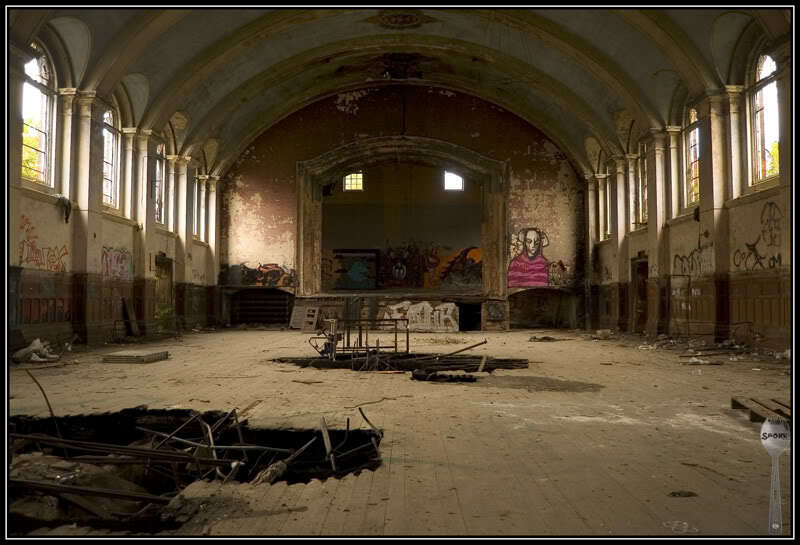 The way the curved arch of the stage affected the view of the rear windows reminded me of the Amityville Horror House, we decided not to risk climbing onto the stage, as the weight would probably rip what was left of the front away. Some of the graffiti in here I though particularly good. Finally after about 5 minutes of looking around and taking photos, we decided to move on, before anyone turned up, "just enough time to take a self portrait though", I said. To avoid potential unwanted meetings (although i'm very fond of german shepherd dogs), we decided to head upstairs and follow that around to the next location, the Water Tower. 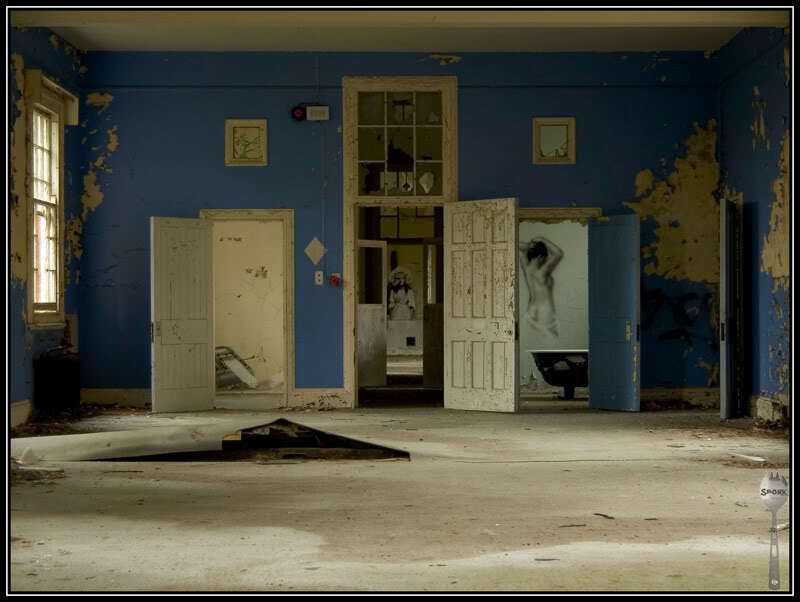 The room that initially caught my attention had the word "neglect" scrawled across one wall. "How very appropriate", Cagey remarked as we crackled across the fallen plaster tiles. 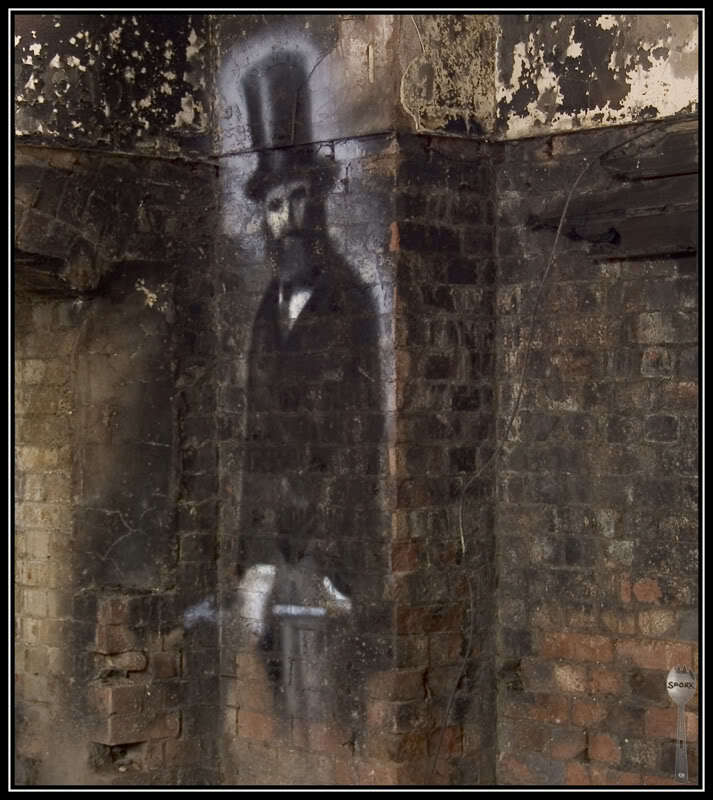 As we cautiously made our way across spongy creaky floors, one thing made itself apparent. 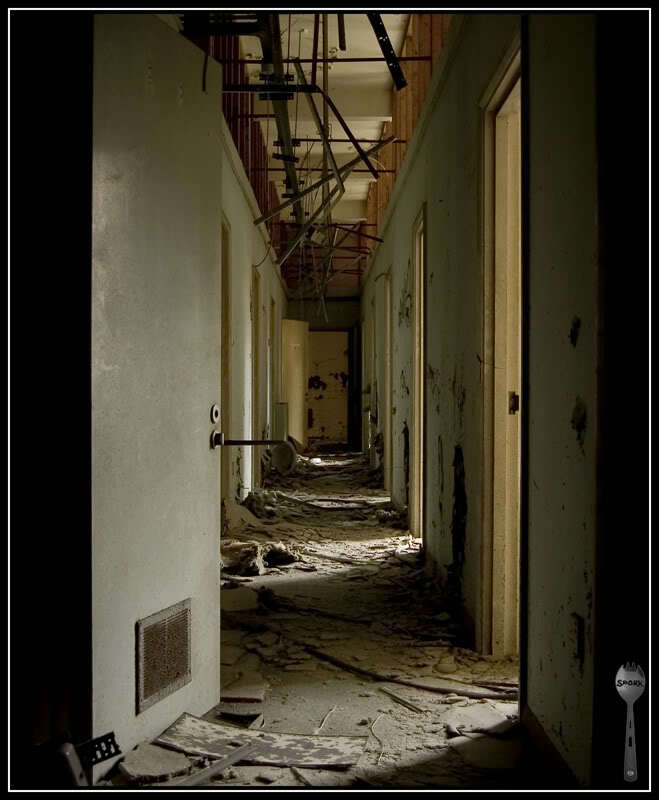 Not only were the corridors in this place highly claustrophobic but they all looked alike, and our orientation, despite the orderly nature of the linked wards, was degrading fast. The lighting from the open cell doors was exceptionally atmospheric. 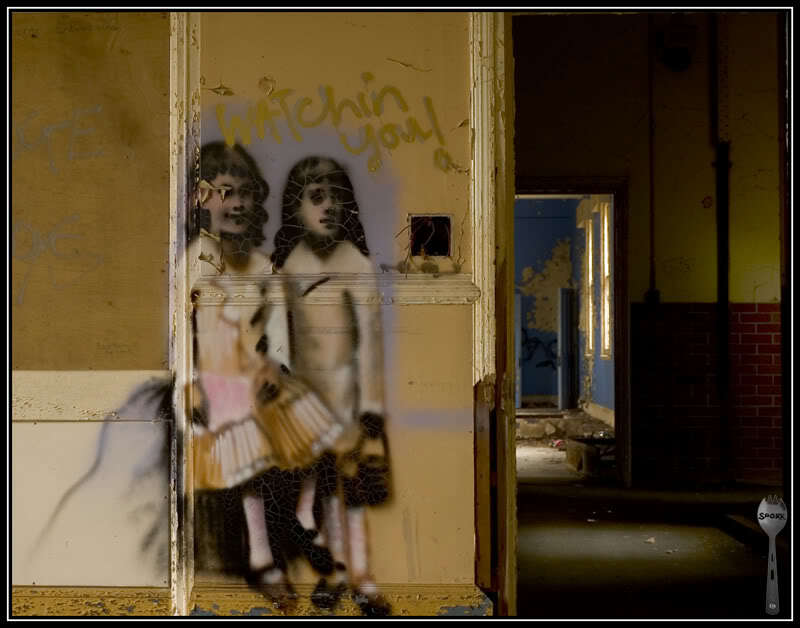 After seeing this graffiti, I couldnt get "The Shining" out of my head, "Hello Sporky. Come and play with us. Come and play with us, Sporky. Forever... and ever... and ever. " 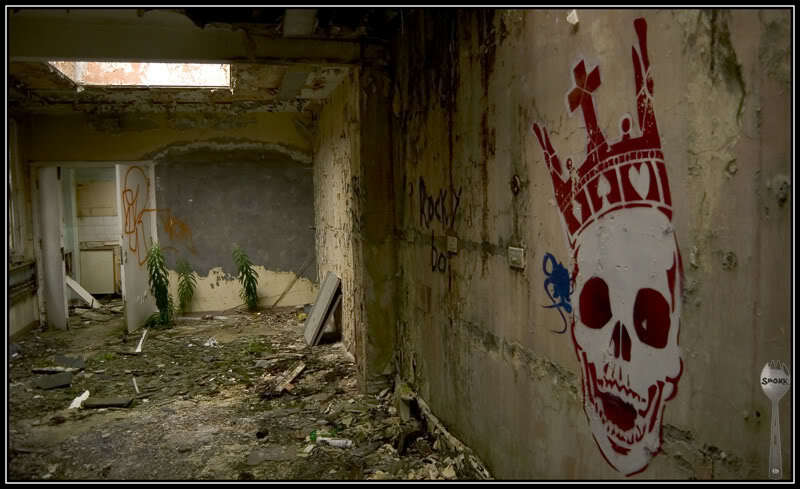 As we crossed the floor of the Blue Room, admiring the bathroom graffiti, and wincing at the creaking nature of the very spongy floor, Cagey remarked "If you die, can I have your camera". 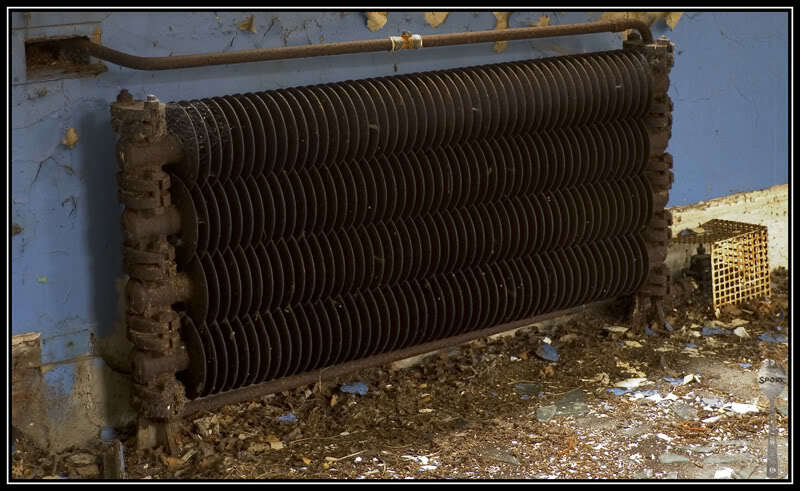 I found these radiators to be particularly interesting in design, the covers all seemed to have fallen off. The trail of broken glass cracked and crunched as we walked further towards the Water Tower. Suddenly we heard voices, and ducked down. A patrol, two men and a dog passed below on the other side of the fence, unaware of us above. "That was close", I breathed to Cagey. We noticed that despite the thickness of the glass, practically every pane in the building was smashed. Bloody vandals. Looking out of the window, hoping for a good rooftop shot of the water tower, I noticed that it had started to spit rain outside, and the wind was picking up. 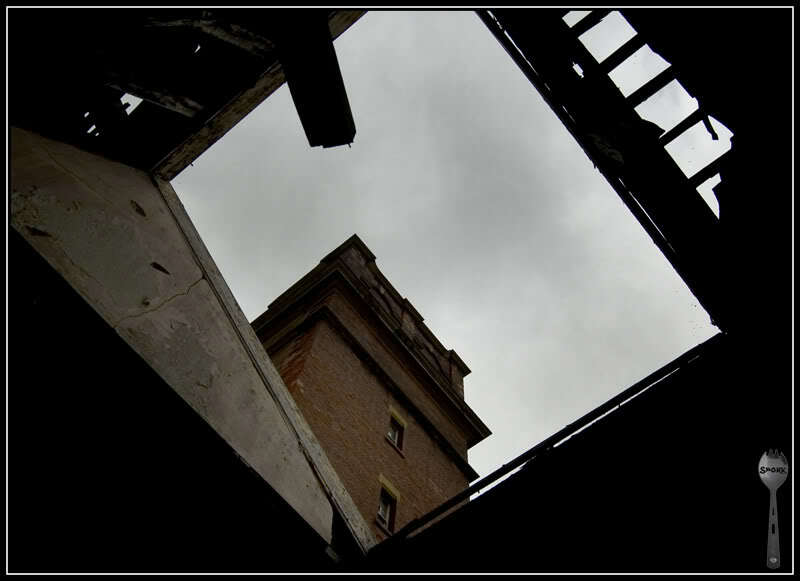 "Looks like rain", I remarked "and I have no wish to spend too much time inside a rotting structure during a shower". 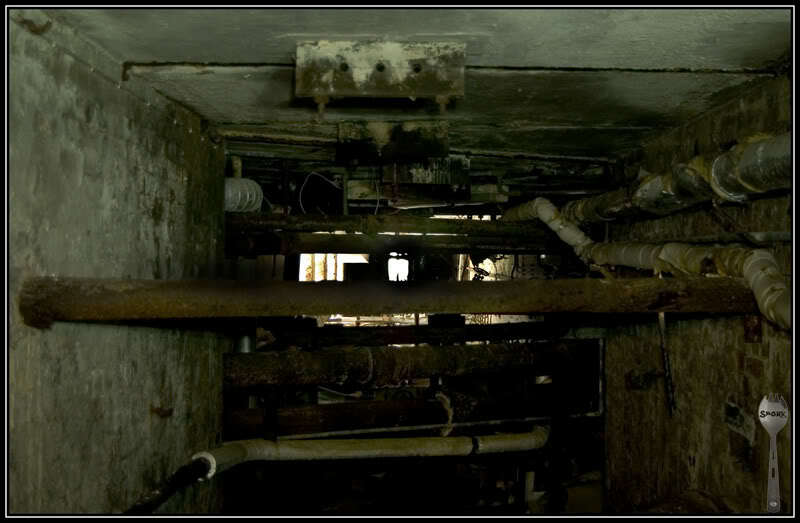 We quickly found some stairs down, which just happened to be right near the base of the water tower, when we spotted stairs that went further down, into the tunnels. Not that we could go much further, as the crazy pipes criss crossed the tunnel making progression impossible. Finally we made it to the base of the tower, which unusually had access directly off the corridor, the urge to climb it was high, but whether the ladders would take our weight was unknown (and unlikely). 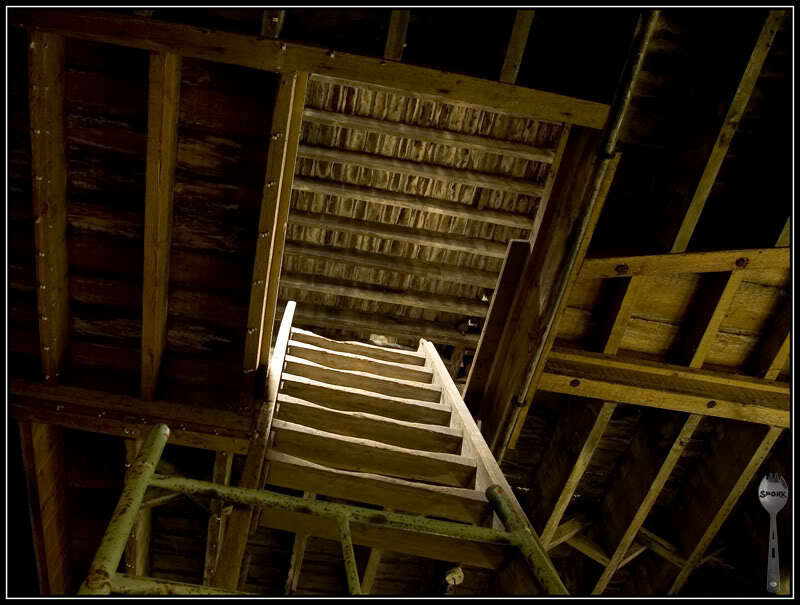 After observing that the majority of the lower ladder was missing, we decided that it probably would not only snap if i put my weight on it, but the whole tower would no doubt collapse. So with some regret, we left the tower base, admiring the Wakefield "thingy". 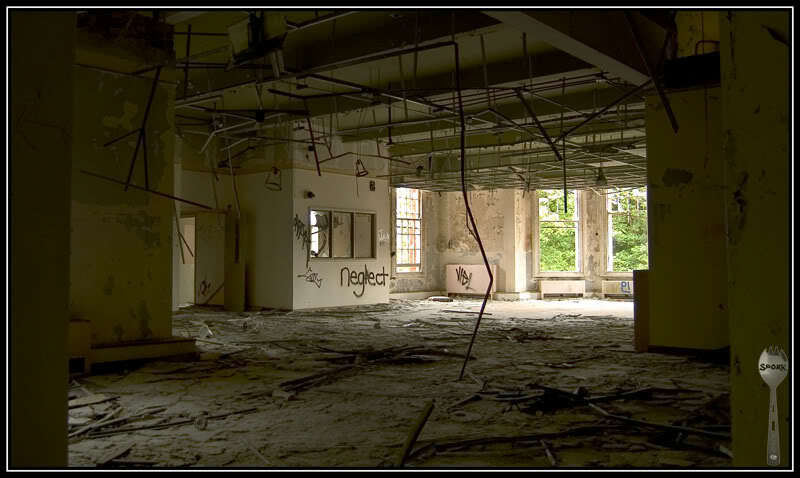 After the ruined grandeur of the 1890s hospital, the ruined minimalism of the 1960s canteen clashed poorly, the wide windows opened letting in wind, rain and plants. 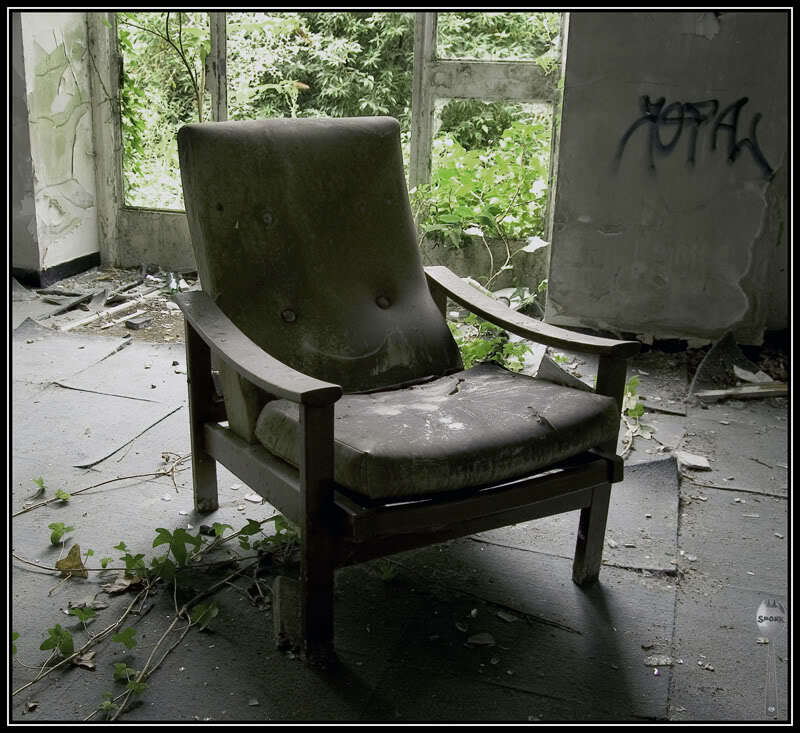 'Oh look, another lonely chair', I thought, but this one was different. The urge to draw a smiley with the 2 buttons was overpowering, and now the lonely chair was happy again. We continued out of the canteen leaving this quirk behind, as we headed for the exit. As we passed a very overgrown room, one with an entire butterfly bush in it, I spotted a flash of red in one corner. 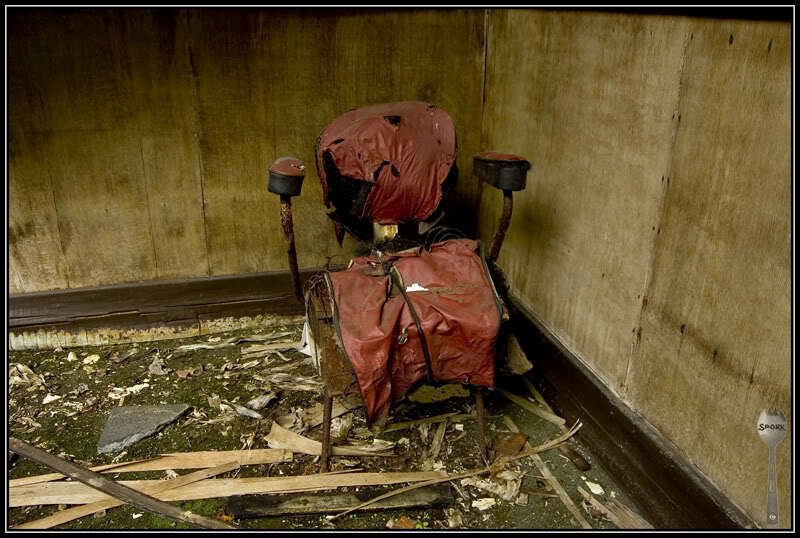 This time the chair looked very much alone and forlorn. I had seen this corner from other pictures, and one of the chairs was missing, the wind started to really pick up and howled around the empty building. I heard Cagey shuffling about in the corridor, and decided enough was enough. We had tempted luck enough. "The patrols seem to work on the half hour, and its about quarter past" Cagey pointed out, so we headed back to the entrance rooms to pack up. We dashed out across the patrol route, keeping a weather eye on the distance for any flourescent shirts and plunged headlong into the bushes, continuing as far as the rear field. "I think we have enough time before they come again to get a panorama of the place". So that was that, a fantastic location to explore, and a fine day out (even with 6hrs of cold, runny nose filled train journey).